This seems like a perfect combination to me although not to often thought about. As you can tell I'm a pretty big fan of peanut butter since you can also find it here, here, and here. I also like to eat it right out of the jar (sometimes sprinkled with mini chocolate chips on the spoon too). I wasn't able to take a picture that fully exhibited the deliciousness of this treat. Just think...peanut butter, chocolate, powdered sugar, and popcorn (and butter!). 1. Put the popcorn in a very large bowl. 2. In a microwave (at 50% power) or over a double boiler, melt the chocolate chips, peanut butter and butter until melted and smooth. Stir in the vanilla. 3. Pour the chocolate mixture all over the popcorn. Using a large spoon, stir until all of the popcorn is evenly coated with the chocolate/peanut butter mixture. 4. 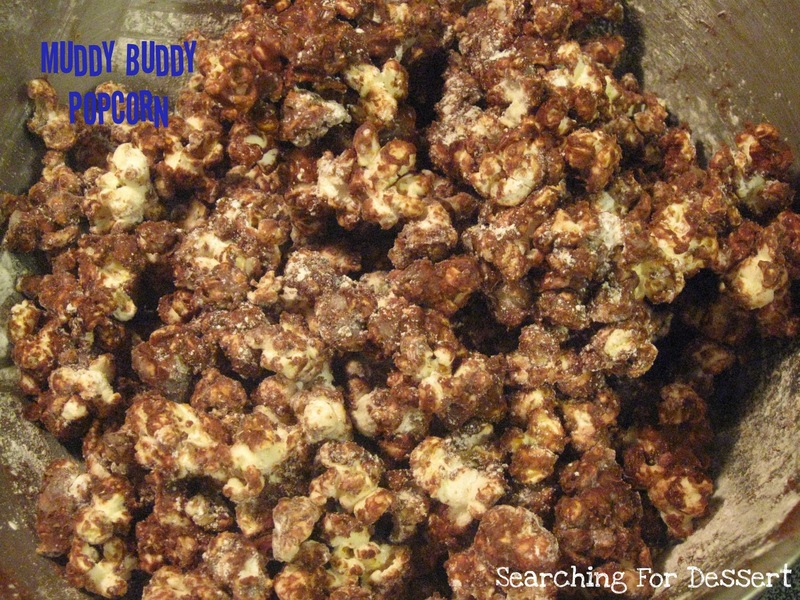 Sift the powdered sugar over the chocolate-covered popcorn and stir until each piece is evenly coated. Spread the mixture out onto a baking sheet and place in the refrigerator for about 30 minutes or until the chocolate is set. 5. Break it up and serve! Store leftovers in an airtight container.